HARTSVILLE, SC (May 15, 2017) – The Legendary Darlington Dragway will play host to the stars of the Professional Drag Racers Association (PDRA) for the first time ever at this weekend’s PDRA Spring Nationals, May 18-20. The historic South Carolina facility is the third stop on the all-eighth-mile series’ eight-race 2017 tour. One of the drivers expected to make a lasting impression on the fans at Darlington is local star Tylor Miller, whose family owns and operates Darlington Dragway. Miller has finished no worse than sixth in Andy McCoy Race Cars Pro Boost points since 2014, currently occupying the fourth spot after the Valdosta and Benson races. While the Hartsville resident is intensely familiar with running his Pee Dee Fleet Truck & Trailer Center ’69 Chevelle at Darlington, he doesn’t expect that to give him a leg up on the competition. Miller has made plenty of test passes at his home track, though he’s just like the rest of the Pro Boost teams in that they’ve never been in PDRA race mode at Darlington. “I can unload my car and go A to B here any day of the week, but of course that won’t hold up at a PDRA race. With the PDRA, you’ve gotta run as fast as you possibly can every single run,” Miller said. Since the PDRA and its racers have had a break on the tour since the PDRA East Coast Nationals at the beginning of April, Miller and his Pee Dee Fleet team have had plenty of time to service their equipment in preparation for this weekend’s race. Along with crew chief and Rage Fuel Systems owner and engineer Mike Kopchick, Miller has spent the last month doing dyno pulls, freshening engine components and looking over the Andy McCoy Race Cars-built Chevelle. Joining Miller and fellow Pro Boost stars Jose Gonzales, John Strickland and Jeremy Ray will be the touring regulars of the PDRA’s pro classes in Pro Extreme, Switzer Dynamics Pro Nitrous presented by MoTeC, Extreme Pro Stock, and Drag 965 Pro Extreme Motorcycle. The PDRA Spring Nationals will also feature sportsman racing in the form of Magnafuel Top Sportsman, Lucas Oil Top Dragster, Campers Inn RV Pro Junior Dragster, MegaCorp Top Junior Dragster, and Edelbrock Bracket Bash. The trending East Side Auto Transport Extreme Outlaw 632 class will also join the PDRA for their second of four races on the 2017 tour. The semifinals and finals from the delayed PDRA East Coast Nationals in Top Dragster, Pro Junior Dragster and Top Junior Dragster will be contested during qualifying at this weekend’s race. The Extreme Outlaw 632 final round between No. 1 qualifier Ken Quartuccio and No. 2 qualifier Johnny Pluchino will run during the third qualifying session. Thursday, March 30 is reserved for a full day of open testing for all PDRA competitors. Sportsman qualifying will begin at 11:30 a.m. Friday, followed by Pro qualifying at 3 p.m. A grudge race between John Stanley’s Pro Extreme Cadillac CTS-V and Robert Albertson’s Jet Dragster will conclude Friday’s action. A third and final qualifying session is scheduled for Saturday at 10:30 a.m. for Sportsman classes and 1 p.m. for Pro classes. Sportsman eliminations begin at 4 p.m. and Pro eliminations kick off at 6 p.m. A wheelstander and Jet Dragster will round out Satuday’s show. Tickets to the PDRA Spring Nationals at Darlington Dragway cost only $10 for general admission to Thursday’s test session, $20 on Friday, and $25 on Saturday. A weekend pass can be purchased for $40. Children aged 10 and younger get in free. With offices in Pittsboro, North Carolina, and Saltillo, Mississippi, the Professional Drag Racers Association is the top sanctioning body in the United States for the sport of eighth-mile drag racing. The PDRA’s professional categories include Pro Extreme Motorcycle, Extreme Pro Stock, Pro Boost, Pro Nitrous and Pro Extreme, the quickest doorslammer class in drag racing. 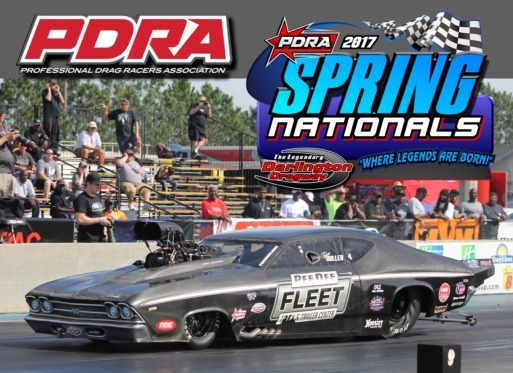 The 2017 PDRA schedule consists of eight national events. For more information on the PDRA, visit www.PDRA660.com.